It was a chilly day after the last snow. As the untouched powder adorned the yard beautifully, Moon and Copper were sound asleep on their beds in the house, when I saw the dark mass. Preparing breakfast on the island, the Pres had his back turned toward the kitchen window while I had already quietly slipped away to get "zoomer". When I returned, the large dark bird was still parading around on top of the stone wall before jumping down to ground level. Placing my hand on the Pres' shoulder I said, "Honey, turn slowly and look out the window." 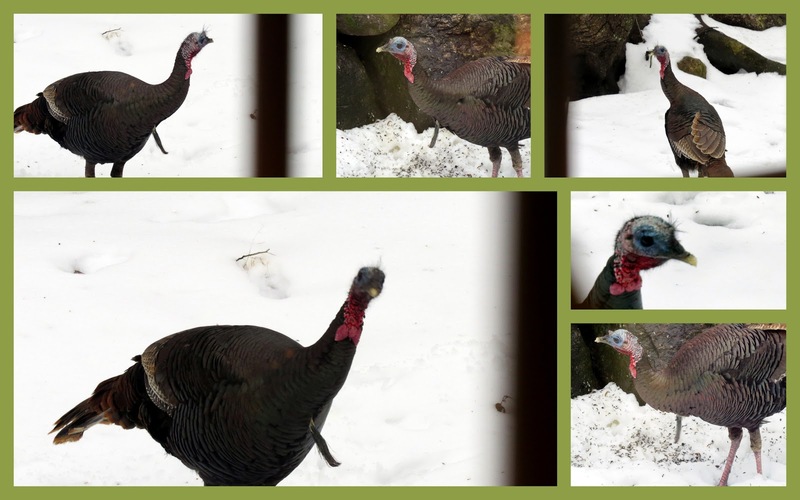 A jake, a young male turkey, was leaving footprints in our powder as he pecked away at the bird seed. Don't you just adore those little tiny hairs on his head? Looks like a comb over gone bad lol. Haha - yes - wild turkeys are a bit goofy looking - but rather fun to watch, and amazingly good at flying! Nice shots! Ready for dinner by Thanksgiving? It's OK cause I know you would not let the Pres hunt this little guy...would you? We have so many turkeys here that I think we should call it "Turkey Hill Farm". You got some great shots of them. His hair kind of looks like mine!